I just finished racing one of the most incredible events of my cycling career, the Friend's Life Women's Tour in Great Britain. Optum improved as a team with every stage, gathering several top ten finishes, and we ended up winning the best overall team GC classification. Cycling is a team sport, but unlike other team sports such as hockey or soccer, often times most of the performance recognition goes to the individual rider. For this reason, it is a nice opportunity when the whole team gets to go up the podium together! The race absolutely set the bar for everything women's racing should be. There was a live highlights show every night with engaging commentary. The courses were quite safe from traffic thanks to a competent police force. There was decent prize money on the line. We were also greeted by massive crowds each day at the starts, finishes, and out on course, even in the pouring rain! Some riders described the crowds as better than those at the Olympics. I loved seeing how many school kids lined the roads every day. It is cool to think we may have inspired the next generation of cyclists. 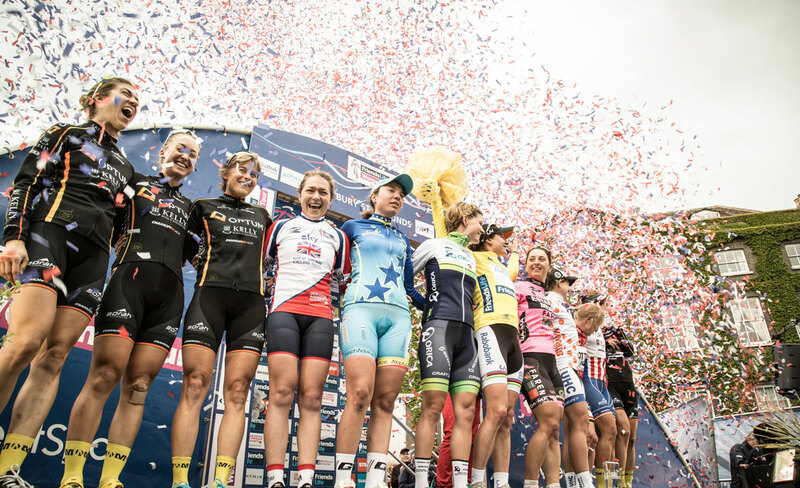 This event gave me so much hope for the future of women's cycling. Women's cycling can generate interest and draw in support when given the chance, let's keep the momentum going! Big thanks to La Fuga and Sigma sport for helping out the team while we were in Britain. I'm at home now in Canada for a short break after a solid three and half months on the road. I was shocked to wake up to some fresh snow the first morning back, isn't winter over? Next race will be the Philadelphia Cycling Classic on May 31st!